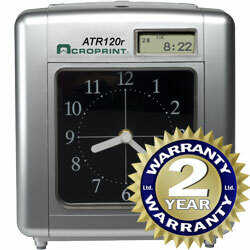 Acroprint ATR120r Time Clock just insert the card in the top slot and the ATR120r will automatically position the card, print the date and time, and eject the card. Thanks to the dot-matrix print head, imprints are clear and easy to read. This value-priced time clock boasts a host of top-requested features. It supports weekly, bi-weekly, semi-monthly and monthly payroll periods and can be set to print in minutes, hundredths, twentieths or tenths. Choose your preferred language from English, Spanish, French, German, Italian or Japanese. You can opt to print "late in" and "early out" punches in red to quickly identify early and late punches. This can help reduce payroll errors and processing time by making time cards edits quick and easy. Both models offer a built-in battery backup to maintain the time even during a power outage. Choose the model with a factory-installed Operational Battery and your employees can clock in and out (up to 200 punches) even when the power is out. Automatic Daylight Saving Time adjustments mean fewer hassles for you. The analog clock, digital display and print head all stay in sync automatically. For added peace of mind, the clock's programming is password-protected, and the clock case is secured with a lock and key. This clock requires the use of ATR121 time cards. The power supply is switchable from 120V to 240V. (An adapter may be needed for use with non-USA style outlets.) The ATR120r is designed to be used for time and attendance recording in a professional office environment and carries an industry leading two-year limited warranty. Optionally print early and late punches in red for easy identification and faster, more accurate payroll processing. Dot-matrix print head produces clear, easy-to-read imprints. Programmable for automatic Daylight Saving Time adjustments. Analog clock and digital display automatically stay in sync and will match the time printed on the card. Build-in programmable buzzer to notify employees of start and stop times. Supports external signal devices (with relay box, available separately). Optional factory-installed operational battery allows employees to clock in and out even during a power outage, up to 200 punches. Clock case secured with lock and key to prevent tampering. Clock programming is password-protected for added security. Requires the use of ATR121 time cards. Two-year limited warranty on parts and labor.